Shares tumbled after management poured cold water on the company's long-term growth targets. 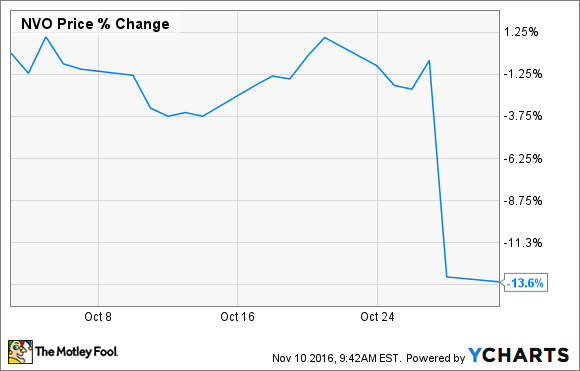 Novo Nordisk's (NYSE:NVO) investors had an October they'd rather forget. Shares of the diabetes giant dropped by more than 13% during the month, according to data from S&P Global Market Intelligence. While the results themselves were decent, management stated that it is seeing huge pricing pressure on its insulin products from insurers in the U.S., which is forcing the company to give concession in order to remain on formularies. That pressure pulled down sales of its older insulins like NovoLog and NovoLog Mix 70/30 by 1% through the first nine months of the year. Thankfully, that was offset by strength in Novo's hit GLP-1 drug Victoza and its next next-generation insulin Tresiba, which allowed the company to post constant currency sales growth of 6% through the first nine months of the year. However, the challenging reimbursement environment caused management to pull back on its full-year growth projections. Updated guidance calls for revenue to grow by 5% to 6%, which is down a smidge from its prior outlook. The lower-than-hoped-for revenue growth will also hit operating profits, too, with new projections calling for constant currency growth of 5% to 7%, down from its prior outlook of 5% to 8%. If that wasn't bad enough, management also greatly lowered its long-term operating profit growth target. It previously had been calling for annual growth of 10% per year, but it now expects that figure to just be 5%. Novo faces some steep competition in the diabetes space from the likes of Eli Lilly and Sanofi, both of which have struggled with growth issues of their own over the last few years. Given that they both have older insulins on the market that work just as well as Novo's older products, it is no surprise to see that insurers are putting huge pricing pressure on all three companies. The best way for Novo to win in the long-term is for it to continue to develop innovative products. Thankfully, the company has a long history of doing just that, and its current pipeline offers reasons for optimism. The recent launches of Tresiba and Ryzodeg prove that the company can still innovate, and it also has a handful of drugs pending regulatory review right now. That should allow Novo to remain the top dog in this massive and growing disease area for years to come.